Driving down to the Florida Keys you get to see this. Rather a lot of it. Two lane black top highway. To the left there's the Florida Straits (to the South). To the Right, there was the Everglades. This was right after the car crossed into the Keys. 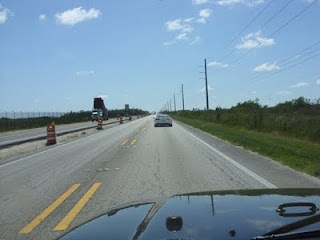 Florida is widening the road to four lanes through the upper keys and I hope it will go all the way to Key West. Unfortunately this will take ... a little time. At this point, the picture was about 120 miles from Key West. 200KM if you're from a Metric Nation like we should eventually be. You do tend to move along at moderate speeds of 45 MPH or roughly 75KPH, with short bursts of frenetic driving to pass that car that is in front of me like I did. Imagine a sports car driving under the speed limit. I did make it without hitting any endangered species or violating any speed laws... or at least creating a public nuisance. I also learned that when my speedometer reads 55MPH, I'm really going around 48MPH, Courtesy of Monroe County, FL, Sheriff's Slow Down And Arrive Alive Billboard. No wonder why Jeeps have a reputation for going slow in traffic, the speedometer reads low!